The Multicolored Lubbock's Fairy Wrasse is also known as the Lubbock's Fairy Wrasse. The male has a bright yellow and red body with blue, brown, and white ornamentation. The females generally do not have quite as bold markings as the males. When courting, the male will display an increased colour intensity. A 50 gallon or larger aquarium, either fish-only or reef, with a shaded area is recommended. 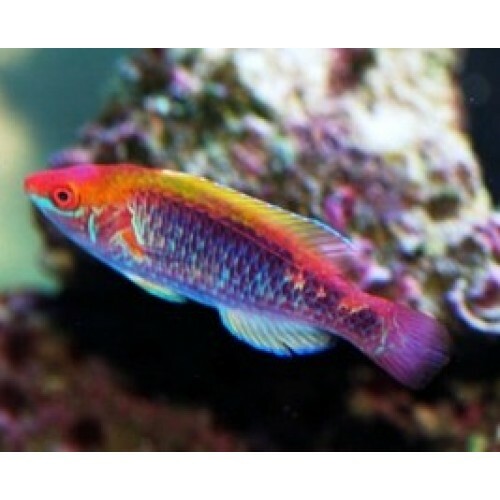 The Lubbock's Fairy Wrasse will not bother fish or invertebrates, making them a perfect addition to any reef aquarium. These fish do like to jump, so a tight fitting canopy is required.